This was my burger. Great Presentation. Chips and Guacamole. These are fresh made chips which were amazing. The guacamole was middle of the road, not great but not bad. This was the Hawaiian Burger, it was on the money. Next time ,I will order this burger. This past week, I went on a date with a person, I mean it could have been an alien. Nonetheless, we went to a small restaurant in the Mt. Vernon area called “Plates”. 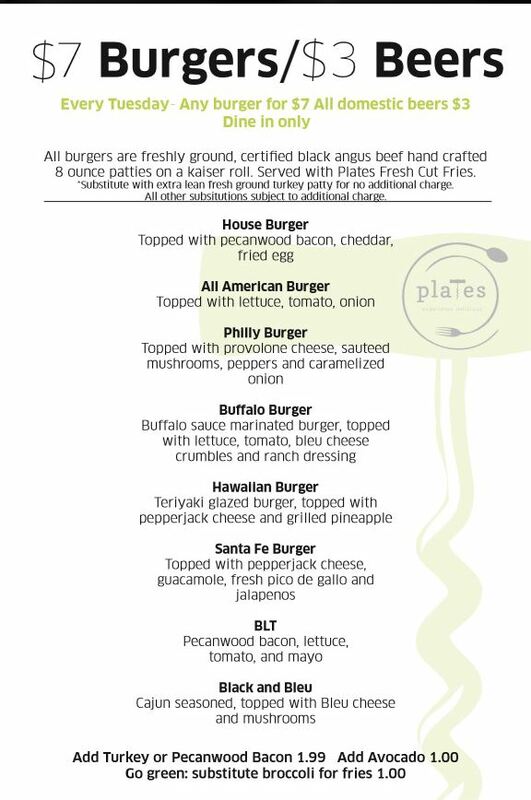 I came across this restaurant in the Baltimore City Paper, which highlighted Tuesday Burger Night with $7 burger and $3 beers. 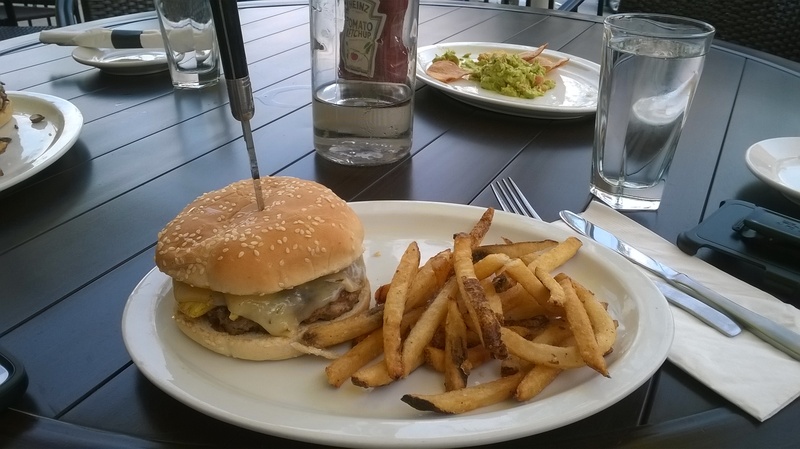 I decided to kill two birds with one sword (GoT reference), a chill date night with burgers! The restaurant is located at 210 East Centre Street in Baltimore, Maryland. Down the street from Center Stage Theater and, connected to the Merritt Athletic club. When you enter the restaurant, you see the welcome desk for the gym, but realize the restaurant is to the right of you. Once you enter into the restaurant, has a very classy feel, and feels like a place where, you can have a quiet happy hour with friends, a nice first date or a quick meal before a show. The low lights, and attentive staff are a nice mix for relaxing evening. The water was served in a tall old school milk bottle. 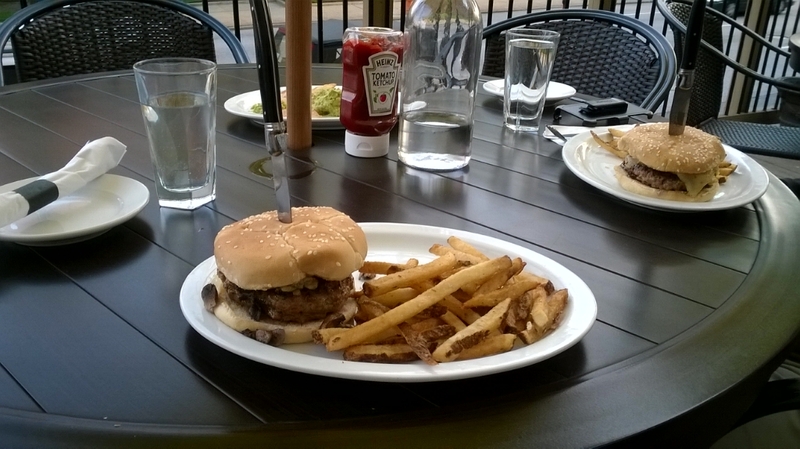 Plates also offered an outdoor Patio, which is cool for enjoying the evening air and atmosphere. Let’s get to the good part the food. 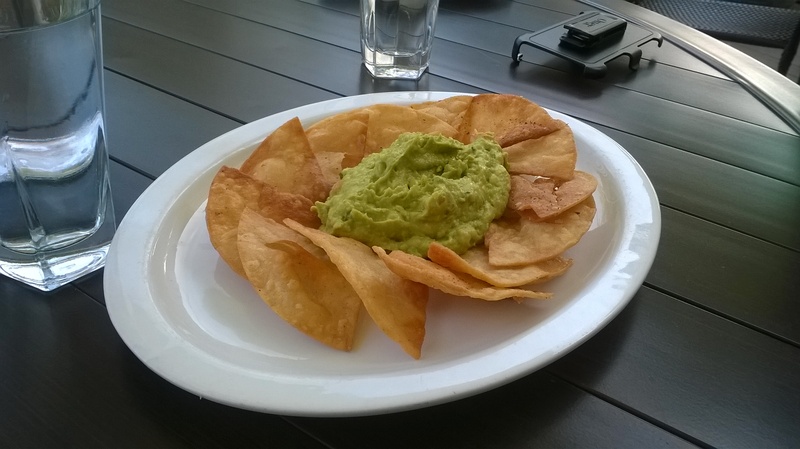 We order a starter with guacamole and homemade tortilla chips. I am sorry to say, I love the fresh made chips, but the guacamole was nothing great, but nothing bad just middle of the Road guacamole. But how were the burgers? In short the burgers were cool. I may need to try other types they offer the next time, I stop in. They had about several burgers you could choose from. Plates offered the option of changing the meat from Angus beef to lean turkey. The do offer other substitutions, but at additional cost. I ordered the Black and Bleu burger with lean ground Turkey with Cajun seasoning, Bleu Cheese crumbles, and Mushrooms, on a Kaiser roll. My date ordered the Hawaiian Burger that was teriyaki glazed turkey burger, pepper jack cheese, with a grilled pineapple. Our server was nice, and told us that it would be at least 20 minutes since it was lean turkey meat. My date burger was pretty good. I would definitely, suggest to order this burger if you are into teriyaki and pineapple. My burger was Ok; I didn’t really taste the Cajun seasoning. The bleu cheese was the shining member of my burger. Even the mushrooms seem that they were not sautéed enough. The French fries were also ok, lightly seasoned with some spice, and didn’t overtake the meal itself. As a side note, I LOVE fries and will usually eat all my fries before finishing a burger, but in this case that did not happen. I had ½ of my fries left over. I blame this on the fact we were eating outside and the evening temperatures stole the heat of my fries. Just to give you an idea about the menu. This came from the website itself.